Nieuw Statendam will join seven Holland America ships in the Caribbean in 2019. Holland America Line marked its 145th anniversary in 2018. The line that once brought passengers from the old world to the new continues to open up new destinations in 2019. From the Great Land of Alaska to the Great Wall of China, memorable cruise itineraries await aboard Holland America Line. Long a leader in Alaska, the line’s rebranded “We Are Alaska” program includes 133 cruises in 2019. Holland America’s mid-sized ships are perfectly suited for Alaskan ports and up-close glacier viewing. From May through September eight of those ships will sail seven, 14 or 21-day itineraries. New onboard Explorations Center (EXC) programming will bring Alaska’s customs and culture to life. And new for the season are 21-day EXC In-Depth Voyages roundtrip from San Francisco. In 2019, the line will expand upon its reputation as Alaska’s premier cruise tour operator. Fifteen different Land+Sea Journeys combine a cruise with a stay at Denali National Park or journey to Denali and the Yukon. Holland America is the only line offering a land program in the Yukon. And, expanded guest experiences await guests in Denali in 2019. For those interested in the sunshine and cultural heritage of Mexico, Holland America Line offers an extended Mexican Riviera season in 2019. Three ships will sail from January through December on itineraries from San Diego. Calls include Mazatlán, Cabo San Lucas and Puerto Vallarta. On all the voyages, EXC programming provides a taste of Mexico’s traditions, cuisine and culture. Venturing from North America to Central America, the legendary lakes and locks of the Panama Canal beckon. In 2019, five Holland America Line ships will offer full transits ranging from 14 to 23 days. The cruises call in Colombia, Costa Rica, Guatemala, Mexico, Nicaragua and islands in the Caribbean. Some cruises also visit Half Moon Cay, Holland America’s private island in the Bahamas. In addition to full transits, Panama Canal Sunfarer itineraries combine a partial transit with southern Caribbean ports of call. Throughout the Caribbean, Holland America Line will offer itineraries ranging from three to 21 days. The eight ships plying Caribbean waters in 2019 include the line’s new flagship, Nieuw Statendam. The ship’s maiden season will include seven-day eastern and western routes. Many of the line’s Caribbean cruises can be extended into Collectors’ Voyages of 14 to 21 days. Those interested in even longer experiences may consider the line’s Immersive Far East Explorations. The 1,916-guest Westerdam explores China, Japan, the Philippines, Singapore, Taiwan, Thailand and Vietnam on cruises ranging from 10 to 31 days. Highlights include a 15-day Thailand & Vietnam itinerary roundtrip from Singapore. A 14- or 15-day Taiwan & Japan cruise travels between Hong Kong and Shanghai, visiting the Philippines, Taiwan, Japan and South Korea. The China, South Korea & Japan cruise includes overnight calls in Shanghai, Tianjin (Beijing) and Incheon (Seoul). The China Explorer from Hong Kong to Yokohama includes two ports in Japan and three ports in China, with overnights at Shanghai and Tianjin (Beijing). And the Japan Explorer is a roundtrip Yokohama (Tokyo) journey with five ports in Japan, including an overnight at Kobe (Osaka); two calls in Taiwan; and a visit to Jeju (Cheju), South Korea. A Japan & Russia itinerary roundtrip from Yokohama visits eight ports in Japan plus Vladivostok, Russia. The season comes to an end with a 15-day spring North Pacific Crossing between Yokohama (Tokyo) and Vancouver, calling on ports in Japan and Alaska. Cruises can be booked back-to-back to form Collectors’ Voyages of 23 to 31 days. While not as exotic as the Far East, the Hawaiian Islands offer their own unique allure. 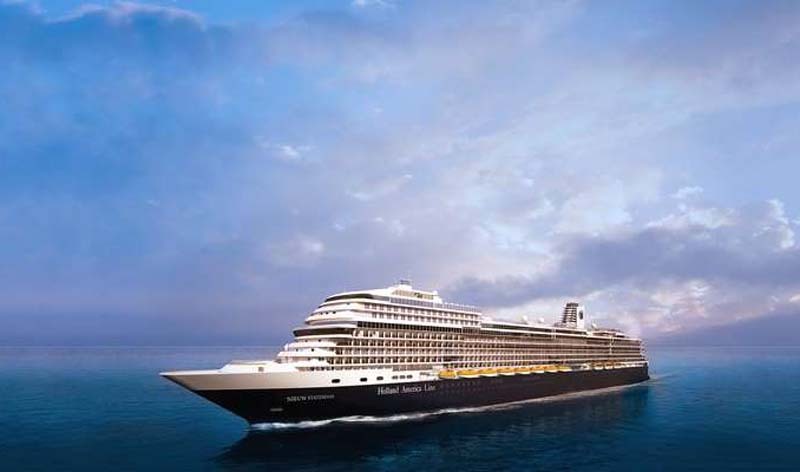 Two Holland America Line ships will offer sailings from the west coast of the US and Canada. The cruises range from 16 to 20 days and feature overnights in Honolulu, plus calls at Hilo, Nawiliwili and Lahaina, as well as Kona. Those who’d like to enhance their South Pacific experience can select a 28-day Hawaii, Tahiti and Marquesas voyage. The roundtrip from San Diego calls on six ports in French Polynesia and two ports in Hawaii. And a 51-day roundtrip from San Diego tells the ultimate Tales of the South Pacific. The cruise calls on Hawaii, Tahiti, America Samoa, the Cook Islands, Fiji, Vanuatu and Tonga.